The story is written by Californian-based South African expat Mark Fine from Joburg, and read by Capetonian and fellow SA expat Dennis Kleinman (who lives just an hour away in LA). 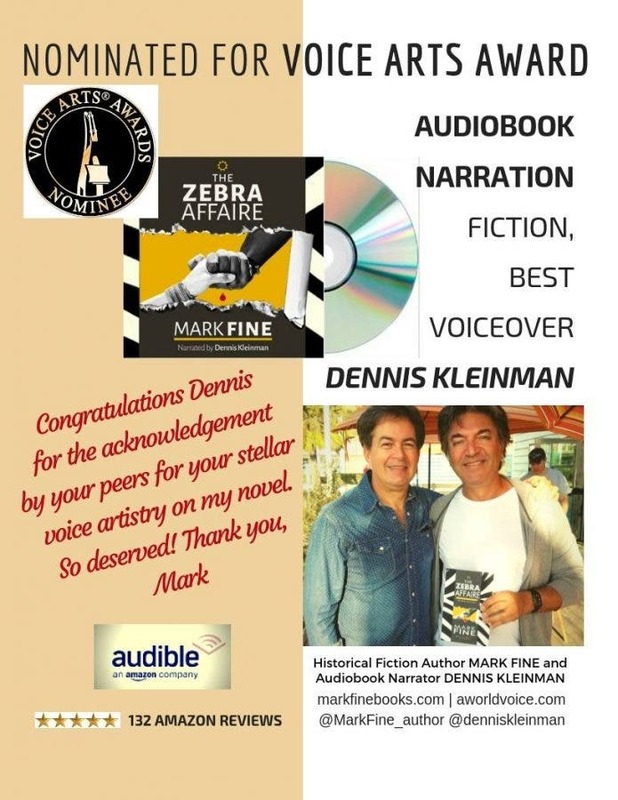 ‘The Zebra Affaire’ – which features a love affair between a white woman and black man during the Apartheid era in SA – has the voices of all its characters read superbly by Kleinman… earning the book a Best Voiceover nomination in the ‘Audiobook Narration – Fiction’ category. The Awards will be held on 18 November 2018 on the Warner Bros. lot. #HoldingThumbs! Mark fine and writing partner Bradley steyn sign a publishing agreement with jacana media for the print rights to their forthcoming book, 'undercover with mandela's spies'. The book is a memoir based on true events in Bradley Steyn's life in South Africa during the dying days of apartheid. 1988 South Africa teeters on the edge of a state of emergency. Exactly 30 years ago, 17 year-old Bradley Steyn crosses Pretoria’s Strijdom Square and walks straight into a massacre. Barend Strydom, the notorious white supremacist ‘Wit Wolf’ is mowing down black bystanders relaxing in the square during their lunch break. Bradley cradles a dying man in his arms, and, later, with reports of 8 dead and 16 seriously injured he is brought face to face with the insanity of the nation. Suffering from acute PTSD, unable to cope with day to day life and consumed by rage, Bradley spirals out of control. His parents unwittingly initiate the next chapter in the story of the boy who crossed the square when they arrange for him to join the SA Navy. Here, angry and unable to work though his trauma he is called upon by the apartheid regime’s Security Branch to ‘confront the threat of Communism’, and the navy serviceman joins the dreaded D Section as a classified government enforcer. But on the political stage events are changing fast: F.W. de Klerk becomes President, the ANC is legalized and Nelson Mandela walks to freedom. However, undermining this progress a sinister Third Force has formed an alliance between the deep state military-intelligence complex, neo-Nazis and white supremacists. With these forces edging the nation toward a bloody race war President F.W. de Klerk is forced to make a deal with Nelson Mandela. The underground Department of Intelligence and Security (DIS) of the African National Congress (ANC MK) recruits Bradley to infiltrate the Third Force network before all hope for a free future is destroyed. Bradley Steyn goes undercover to help unravel the extremist’s masterplan—but will his time run out before they discover he is working for Mandela’s Spies? This astonishing true-life thriller reveals for the first time some of the dirty secrets of a dirty war, fought by both the ANC and the Government of the day. The acclaimed apartheid historical fiction novel The Zebra Affaire where author Mark Fine chronicles the courageous and intense love story of a proud Zulu descendant and the daughter of a white farmer in 1976 South Africa has now been released in audiobook format on Audible.com. 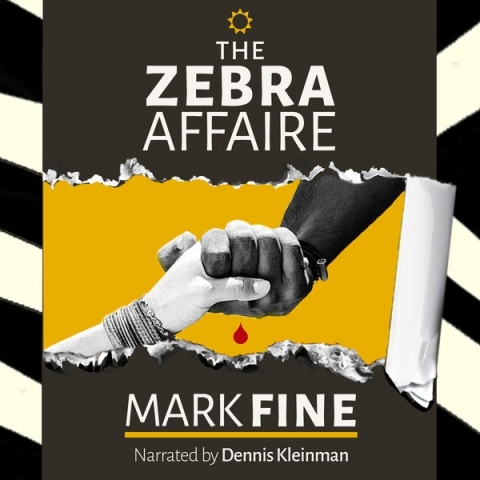 The critically acclaimed apartheid novel The Zebra Affaire by South African author Mark Fine has been released in audiobook format on Audible.com, with narration by fellow countryman Dennis Kleinman. The Zebra Affaire is an acclaimed historical fiction novel by Mark Fine set in 1976 Apartheid South Africa. It tells the courageous, forbidden love story of Stanwell Marunda, a descendent of the Zulu, and Elsa, the daughter of a white farmer, under an intolerant, racist regime. The book is lauded for its authenticity and seamless fusion of romance and suspense within one hundred years of South African history. Recently described by critics as ‘To Kill a Mockingbird’ meets ‘Romeo & Juliet’ in ‘Out of Africa’, the novel is now available in audiobook format on Audible.com. First released in July 2015, the novel is now being relaunched as an audiobook to meet renewed interest for its multicultural story and interracial romance with recent events unfolding in Zimbabwe, the engagement of Prince Harry and Meghan Markle, and the rise of white supremacy sentiments around the world. The narration was performed by fellow South African Dennis Kleinman, chosen by Mr. Fine out of more than 50,000 voice actors on Audible’s database. Mr. Kleinman, while in studio producing the audiobook, read a scene on page 192 in the paperback. In the scene protagonists Sid and DGF discuss a painting by a South African artist named Ilse Kleinman. Narrator Kleinman realized the fictional characters in the novel were referring to his real mother. The new Zebra Affaire audiobook has received sterling reviews by Senior South African Diplomat, Thandi Lujabe-Rankoe, fellow authors and hundreds of readers. For additional details about this courageous and relevant novel, and the forbidden love story it tells, visit the website link provided above or at https://www.audible.com/pd/B076C1CVNS/?source_code=AUDFPWS0223189MWT-BK-ACX0-098328&ref=acx_bty_BK_ACX0_098328_rh_us .